* Claire had an injury as a puppy which prevented further CERF testing. Claire was a fun-loving party-girl. She was extremely friendly and rarely met someone she didn't like. She was excellent with other dogs as well. In fact, her temperament was so outgoing that it often surprised folks who are used to a more reserved Tervuren. She was a hard worker when hard work is needed, excelling at obedience training, conformation, and herding, but even when working hard, Claire has a happy disposition. She was taken from us in a freak accident far too young. 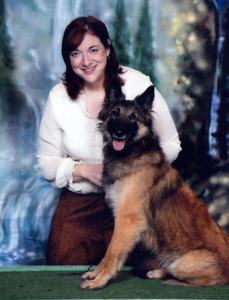 Claire was bred by Kimberly A. Cassida & Joseph J. Paling of Mason, Michigan.